Emu's first USB 2.0 interface, and their first to offer Mac OS X compatibility, dispenses with DSP effects and complex software front-ends, majoring instead on hands-on controls and practical studio features. Have they hit on a winning formula? Emu's DAS (Digital Audio System) range has proved extremely popular since the flagship 1820M and 1212M interfaces (both with 'mastering'-grade converters) and the slightly cheaper 1820 version were first released in 2004. Later in the same year we saw the budget 0404 model, with less exotic converters, like the 1820. These PCI-based interfaces were supplemented in 2005 by the 1616M/1616 models, both of which shipped with a PCMCIA Cardbus adaptor for use with PC laptops. All these models featured the same set of DSP effects, courtesy of Emu's EDSP chip. Despite the almost identical names, the 0404 USB 2.0 interface under review here is a different beast from the original 0404 (the numbers merely specify the numbers of inputs and outputs). For a start, it's the first Emu audio interface to employ a USB 2.0 connection, the first of the range to abandon DSP effects, and also the first to offer cross-platform Mac OS X as well as Windows XP and x64 drivers. I was supplied with Windows XP software (which requires Service Pack 2 to be installed) and installation was quick and easy. In stark contrast to the spartan collection of flying leads emerging from the original 0404 PCI, the 0404 USB has a smart grey and black desktop case with lots of knobs, buttons and LED indicators. The reason for this becomes more obvious once you've installed the drivers and software and have clicked the Emu logo on the Windows Taskbar. Instead of the now-familiar Patchmix DSP software, a very much simpler control panel appears, providing read-outs of current sample rate, internal or external clock setting with associated Lock indicator, digital input status and S/PDIF or AES Pro output format. Emu's Patchmix DSP utility has proved to be a mixed blessing: while supremely flexible and configurable for the experienced user, it has proved a constant source of confusion and frustration for new users, so having dispensed with the DSP effects, Emu have obviously decided to replace the utility's remaining functions with hardware equivalents. I suspect this approach will be far more popular! The 0404 USB features two of the same Emu-designed, ultra-low-noise mic, line and high-impedance instrument preamps as their 1616 series, with the same Neutrik Combi sockets, rotary gain controls, global 48V phantom power and LED meters for monitoring input level. The useful option of individual soft limiting (enabled and disabled using the Control Panel utility) is available for gently limiting signals above -12dBFS, to guard against the nasty sounds of digital clipping. Of particular note are the new individual ground-lift switches for each analogue input, which should tackle ground-loop problems that may arise when you plug in earthed mains-powered gear such as keyboards. As far as I know, this is a very welcome first on a desktop interface. Together with the supplied non-earthed mains PSU (the 0404 USB can't, unfortunately be buss powered) and the balanced line-level outputs, it should ensure an absence of whistles, buzzes and hums when the 0404 is connected to a wide variety of external gear. The main two balanced/unbalanced analogue outputs are duplicated on a stereo 3.5mm output and have a dedicated analogue rotary level control on the front panel. There's also a separate headphone amp with its own independent level control. Digital I/O is usefully provided in both TOSlink optical and coaxial formats, switched from a front-panel button, while both digital outputs can also pass Dolby AC3-encoded 5.1 surround sound audio, for listening to DVD soundtracks on an external AC3 decoder. All input signals can be sent to either the main or S/PDIF outputs for 'zero' latency monitoring, selected using another front-panel button. Monitoring can be switched to mono, which could be handy if you're recording vocal and guitar on different inputs and want to hear them both centrally in your monitors, or to identify mic phasing problems. The Direct Monitor signal even has its own rotary level control. Completing the control roster are front-panel activity LEDs for the single MIDI input and output and to show Internal or External Sync status. Sample Rates: 44.1, 48, 88.2, 96kHz, plus 176.4 and 192kHz from internal clock. Mic/guitar/line Inputs: two, up to +60dB gain, balanced XLR with switchable global 48V phantom power, or unbalanced TRS quarter-inch jack line instrument input with 1MΩ impedance; individual ground-lift switches. Analogue Outputs: two TRS quarter-inch jacks at +12dBV level balanced, +6dBV unbalanced, analogue level control, plus headphone output with analogue level control. Digital I/O: S/PDIF in and out, up to 24-bit/96kHz on phono coaxial and TOSlink optical, AC3 and DTS compatibility, MIDI I/O. Dynamic Range: 113dBA inputs, 117dBA outputs. RMS Jitter: better than 500 picoseconds in PLL mode (48kHz, coaxial S/PDIF sync). Frequency Response: 20Hz to 20kHz, +0.06/-0.035dB. THD + Noise: 0.001 percent measured at 1kHz. The 0404 supports 24-bit audio at sample rates from 44.1kHz to 96kHz when all four inputs and outputs are in use, and rates of 176.4 and 192kHz using two inputs and two outputs, with MIDI disabled. The quoted jitter levels look similar to those of other Emu models, and overall the 0404 USB should prove easier to integrate into some studios than previous Emu interfaces. To turn to the 0404's frequency response, my tests with Rightmark's Audio Analyser showed that Emu have removed the HF 'droop' exhibited by previous interface models in their range. At a 96kHz sample rate the frequency response now extends to 37kHz (-0.5dB) instead of the 24kHz of the 1820M. Dynamic range is also good; not quite as low as the 117dBA I measured for the 1820M, but very good all the same — and considerably quieter than many competitors — at 113dBA. Figures aside, it's really the sound that counts, and as my own Emu 1820M has similar clock circuitry and converters from the same manufacturer (AKM), I spent a long time comparing the two interfaces. The differences were subtle, especially with stereo imaging, but I declared the 1820M the winner for its more open and natural top end and more rounded bass (both, I suspect, courtesy of its more sophisticated converters). Nevertheless, for a £150 interface the 0404 USB provides surprisingly good audio quality. In PC Notes October 2006 I said I planned to start using Centrance's Latency Test Utility when testing audio interfaces, to reveal any 'hidden extras' in real-world audio latency. A-D and D-A converters usually each impose a fixed 1ms to 1.5ms latency over and above whatever software buffer latency settings you use, and in the case of the vast majority of PCI and PCMCIA interfaces (including Emu's own), these are the only extra delays. However, USB and Firewire interfaces often employ additional hardware buffers, and a few less scrupulous manufacturers conveniently ignore these when declaring their total input and output latency figures to Cubase SX. I'm pleased to report that Emu have declared these extras accurately, so you know exactly what's what. With a concise yet informative display, this control panel is a doddle to use compared with the sophisticated but confusing Patchmix DSP utility of previous Emu interfaces.Keeping the total input latency fairly low is important when monitoring with plug-in effects, and the extra 1.878ms imposed by the 0404 USB is little more than that of most PCI and PCMCIA interfaces, while the rather higher 4.893ms added to the output latency seems fairly typical of USB and Firewire interfaces (the extra buffering ensures smooth playback). ASIO driver performance was good, running on my laptop down to its lowest 2ms setting, and giving a total real-world Cubase SX input latency of 3.878ms and an output latency of 6.893ms. Direct Sound and MME driver performance was also better than average, at 30ms and 45ms respectively, when measured using NI's Pro 53 soft synth. I was also pleased to find that MIDI loopback performance, as measured by the Miditest utility, doesn't suffer unduly as a result of its extra USB journey: MIDI latency was just 1.7ms, compared with the 1ms or so of PCI and PCMCIA interfaces; MIDI ports on many Firewire interfaces can have latency of 4ms or higher. Although their names are so similar, you really can't compare the 0404 PCI and 0404 USB, as the latter has so many additional features, such as mic/instrument preamps with soft limiting, balanced outputs, headphone amp and lots more analogue controls, and its audio quality is also rather better, although the 1212M, 1616M and 1820M still outdo it on that front. It's perhaps ironic that Emu have abandoned their DSP effects on the 0404 USB when other manufacturers, such as Focusrite and TC Electronic, are starting to include them in their interfaces, but many new users only seem to be tempted by onboard effects if they are of higher quality than the plug-ins they already own. There's also no denying that such features complicate the product, so the fact that Emu have dropped the Patchmix DSP mixer may actually encourage some new users. 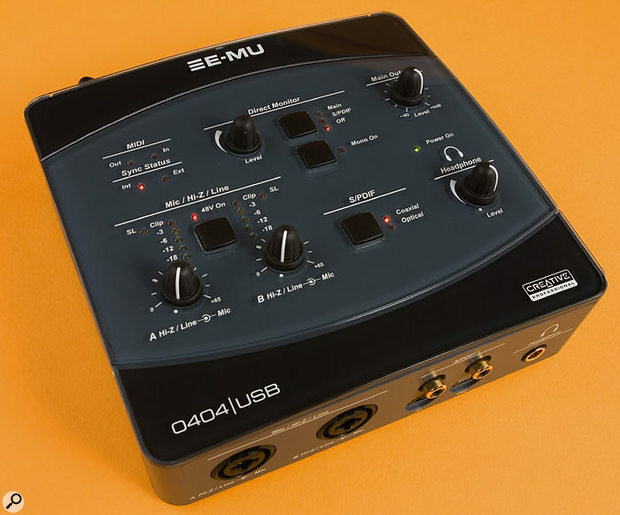 Overall, while the 0404 USB has Emu's high-quality 'house' sound, it has a markedly different feature set from previous products, that will appeal to those who prefer hardware knobs and indicators to software utilities. I'm pleased to see another USB 2.0 interface on the market, as there are relatively few compared with Firewire models, and Emu's 0404 USB offers something genuinely different. As long as musicians realise that it's not simply a desktop version of the PCI model, it ought to sell very well. There are plenty of stereo in/out audio interfaces with mic and guitar inputs, headphone amp and digital and MIDI I/O, but if you want 192kHz capability there's little competition for the 0404 USB. One with fewer features and a lower price is Emu's simpler 0202 USB, offering a single mic preamp with no phantom power option, single-LED metering, no analogue output level control and no digital or MIDI I/O, although (unlike the 0404 USB) the 0202 can be USB buss-powered. If you're happy with a highest sample rate of 96kHz, two models with similar feature sets and price in the UK are Tascam's US144 and M-Audio's Fast Track Pro. However, possibly the closest contender is Edirol's UA25, which is the only unit to incorporate soft-limiting options like Emu's 0404 USB and has a similar price tag. Lots of hardware knobs to twiddle, including output level, headphone level and monitor level. Mic and Instrument inputs have handy soft-limit option and high impedance for guitars. Better audio quality than the 0404 PCI model. No confusing Patchmix DSP utility or DSP effects. USB buss powering is not an option. No sophisticated Patchmix DSP utility or DSP effects. 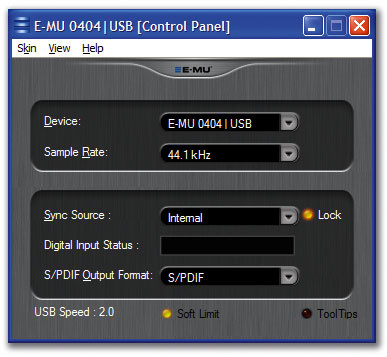 Despite the confusingly similar name, Emu's 0404 USB is a completely new interface to its predecessor, with better audio quality and a very different specification that will appeal to those who prefer hardware controls over DSP functions. Emu 0404 USB £149.99 including VAT. Emu Europe +353 1 433 3201.